Pear is one of my favorite fruit. I loooove the subtle sweetness and fleshy texture of baked pears, especially when they are the key ingredient in a cake, a tart, or any dessert. 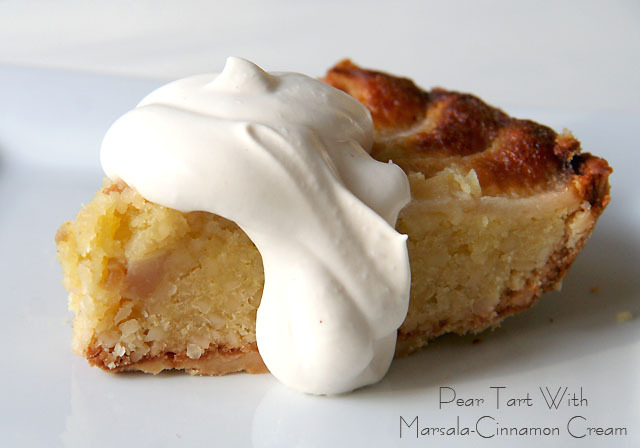 Last weekend, I went to my local market and the abundance of pear of all kinds, reminded me of this recipe that I wanted to try last fall, but it never happened- Pear Tart with Marsala-Cinnamon Cream. Good thing, pears are still in season, and even though it is common to find pears all year round, they tend to be juicier and sweeter, during the fall and winter. I finally made the tart and OMG!! it was fantastic. Easy to make, this recipe may take some time to get to the final product, but it works, it looks beautiful, tastes delicious, and you don't need to be a pastry chef to make it. So, here is my adaptation of the original recipe that I found in "Tarts", a book from the "Love Food" collection, by Parragon Books... Hope you enjoy it as much as I did, making it and tasting it!! Lightly grease a 9-inch loose-bottom, fluted tart pan. Sift the flour and salt into a food processor, add the butter, and process until the mixture resembles fine bread crumbs. Tip the mixture into a large bowl, stir in the sugar, and add one or two tablespoons of cold water, just enough to bring the dough together. Turn out onto a floured counter and roll out the dough 3 inches larger than the pan. Carefully lift the dough into the pan and press to fit. (If this step becomes difficult, do what I did. Press the dough inside of the pan with your fingers until it is all covered with a thin and uniform layer). Roll the rolling pin over the pan to neaten the edges and trim the excess dough. Fit a piece of parchment paper into the tart shell with dried beans, and let it chill in the refrigerator for 30 minutes. Meanwhile, preheat the oven to 375F. Remove the pastry shell from the refrigerator and bake blind for 10 minutes in the preheated oven, then remove the beans and paper. Return to the oven for 5 minutes. Put the pears, lemon rind, Marsala, 2tbps of the sugar and the water in a pan and bring to a boil. Let simmer for 30 minutes, or until pears are tender. Leave in the liquid to cool. Slice the pears lengthwise, not too thin, so the tart gets enough of the pear flavor. Melt 11 tbsp. of the butter. Beat the remaining sugar with the eggs and stir in the melted butter, then the almonds and flour. Pour the almond mixture into the pastry shell and arrange the pear slices in a cartwheel pattern on top. Make sure the pear covers the top completely, otherwise the mixture will rise through when baking it. Melt the remaining butter and brush it over the pears. Bake for 30 to 40 minutes. Meanwhile, put the Marsala, sugar, and cinnamon stick for the syllabub (cream) in a pan and let simmer for 5 minutes. Strain and let cool. When you are ready to serve, make the cream. Put the cooled Marsala in a bowl and gradually whip in the cream with an electric whisk until soft peaks form. Slice the tart and spoon a spoonful of cream on each slice. 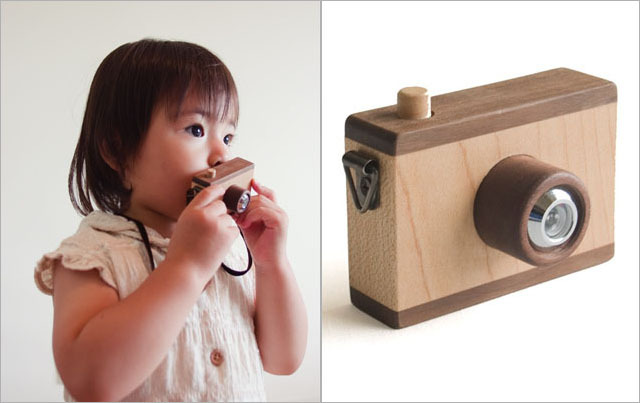 Cool and cute, cameras have become a trendy theme for kids lately, and we are loving these original designs. 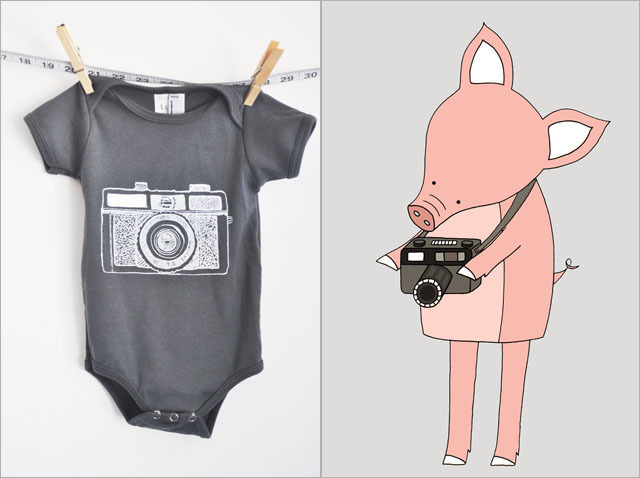 Onesies, tees, wooden toys, wall art and, even a lovely DIY craft- we picked them all. 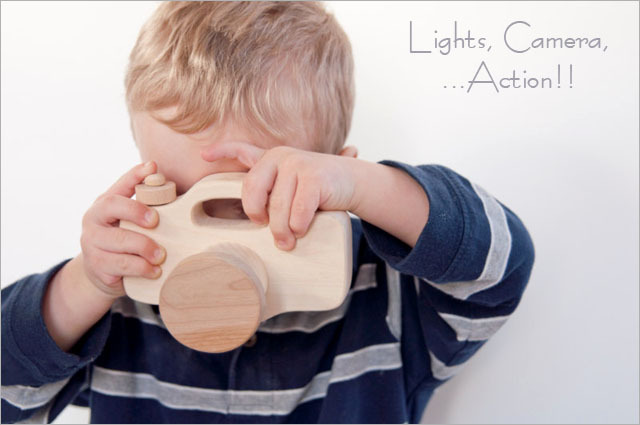 So, go ahead... lights, action, and "click" on the links to choose your favorite one. Lovely!!... Aren't they?? ...Which one would you pick?? 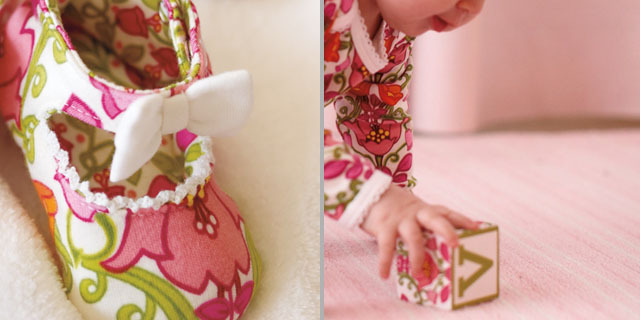 Before its launch in stores and website on March 14th, here is a peek of Vera Bradley's new Baby collection... It only makes sense that after designing bags and accessories for every single stage in women's lives, the brand decided to awaken girls' sense of fashion, from the very beginning. Colorful flowers and vibrant paisley patterns will be adorning the girls-only line, an arrangement of baby dresses, onesies, cute mary janes, plush bunnies and bears, blankets, bibs, and of course, baby diapers bags. 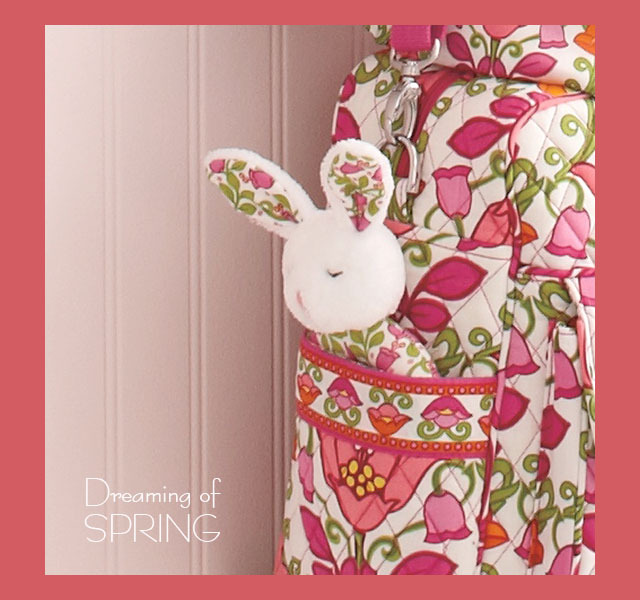 I must say, not all the time I fall in love with Vera Bradley's busy patterns, but this baby collection seems very feminine, delicate, and perfect for the upcoming spring baby showers. I like the idea of mixing-matching and making a nice gift set. Even though Vera Bradley's website is keeping the suspense and only announcing the date for the launch of the new line, a few more pictures are posted on one of their boards, on Pinterest... Take a peek!! Vera Bradley Baby Line available here, from March 14th. Pictures also available here, on Pinterest. I've always believed that simple and basic toys bring children's imagination a lot further than those equipped with batteries and sounds... Isn't it puzzling how little ones open a box with a toy inside, and immediately start playing with the box, rather than with the toy? 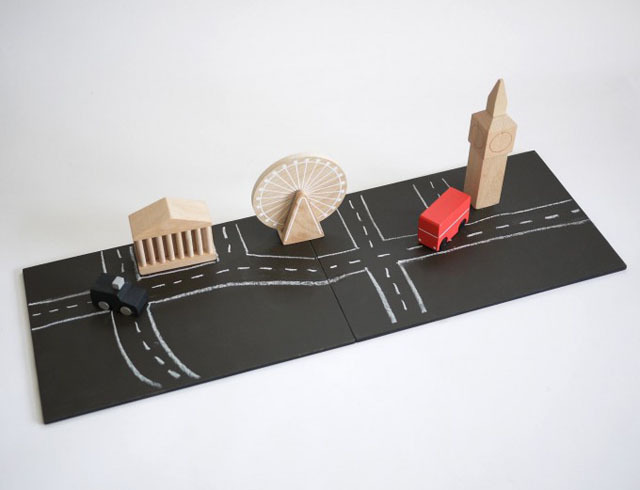 It seems like a cardboard box has more power to challenge a child's creativity- maybe because they can manipulate it and make anything they want out of it. Japanese designed Kukkia Toys brought that idea back to my mind. 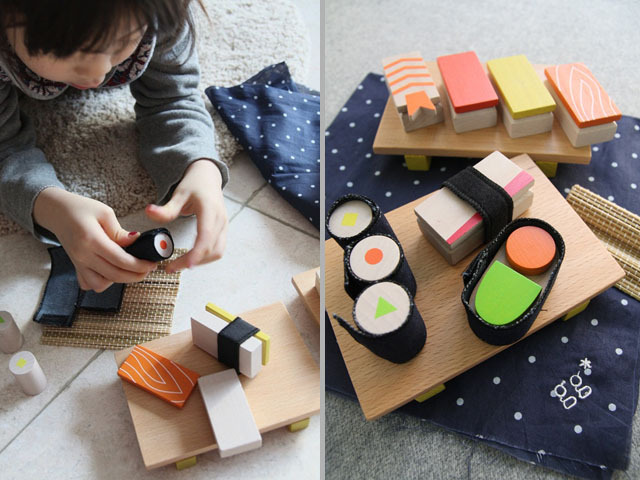 Basic shapes made of natural materials with a combination of subtle and vibrant colors, surely do the trick in kids' busy hands- it's a silent invitation to touch and build, touch and play. 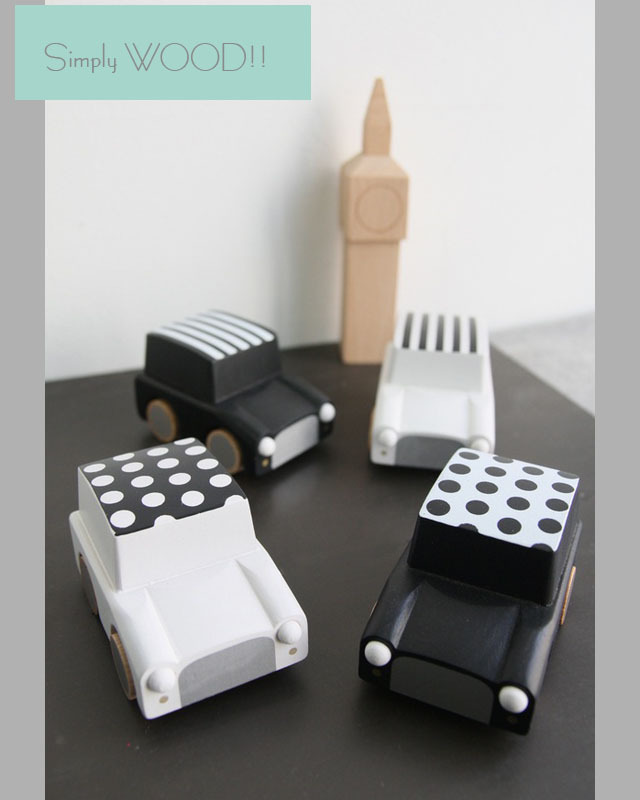 All made of sustainable beech wood, the collection goes from black and white polka dots cars to a mini City of London with its traditional Big Ben and a doubled-decker bus, from a sushi set with denim velcro seawed to star dominoes with a hundred stars to count and count all the way to the moon. Adorable!!... Definitely, it's all in the details!! For list of stores and worldwide shipping, I suggest visiting their Facebook Page, here. 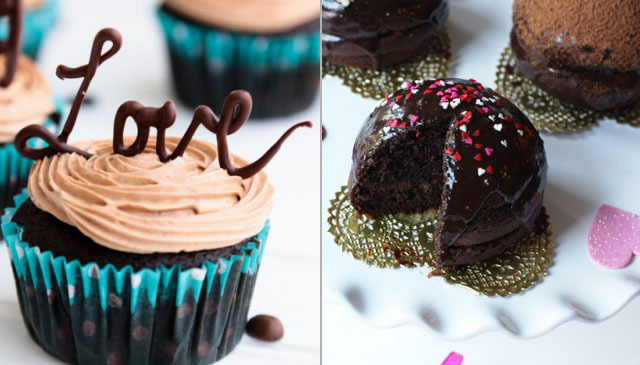 Valentine's Day Treats for Little Cupids and Big Ones Too!! So, that's it!! 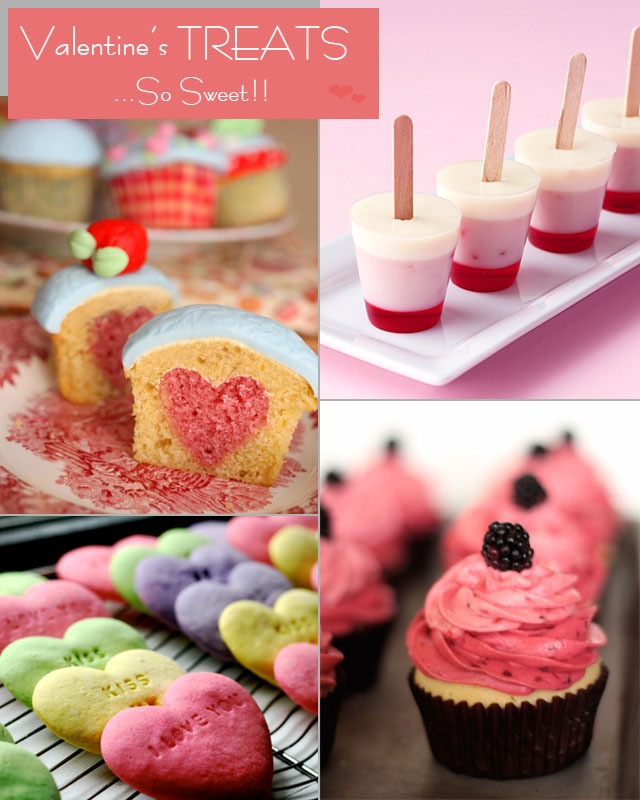 ...Valentine's Day is here and we are celebrating with a bunch of delicious treats for everyone. A perfect occasion to be creative and why not, to get a little fancy, and surprise our very loved ones with something we've made with much affection... Of course, hoping that we have the time for it! 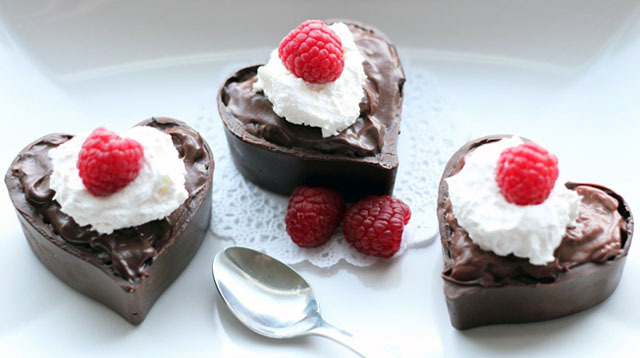 So, if that is the case, pick your favorite recipe, gather your ingredients, dust your mixer off, and go rich and decadent with our favorite Valentine's Day treats. Make it a surprise, light some candles, and say "I love you" many times today. Don't forget, hug and kiss abundantly, over and over again!! Happy Valentine's Day, everyone!! ... Cheers to love, friendship and happy hearts!! 1:: How to Bake a Heart Into Your Cupcake by Made with Love by Me. 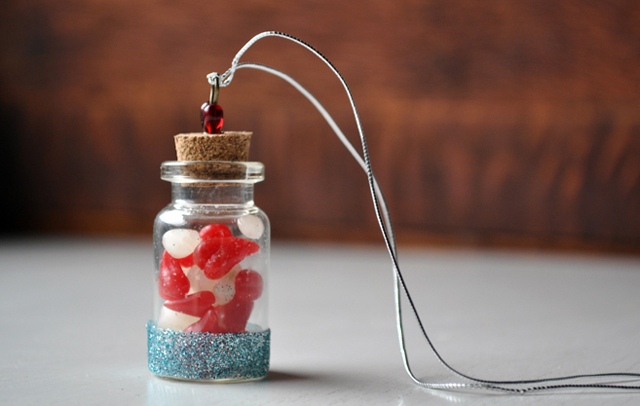 2:: Valentine's Jelly Pops by Taste for Adventure. 3:: Lemon Berry Cupcakes by Patisserie Natalie at Cupcake Spy. 4:: Conversation Heart Sugar Cookies by Kelsey's Kitchen. Valentine's Day preparations are in full force... Next in my list, handmade Valentine's cards for my girls' friends at school. I could have spent a week surfing the internet and getting inspired by my favorite blogs and their tutorials... Soo many!! It seems like love and friendship really get people's creativity flowing, and my power of decision a little weakened. 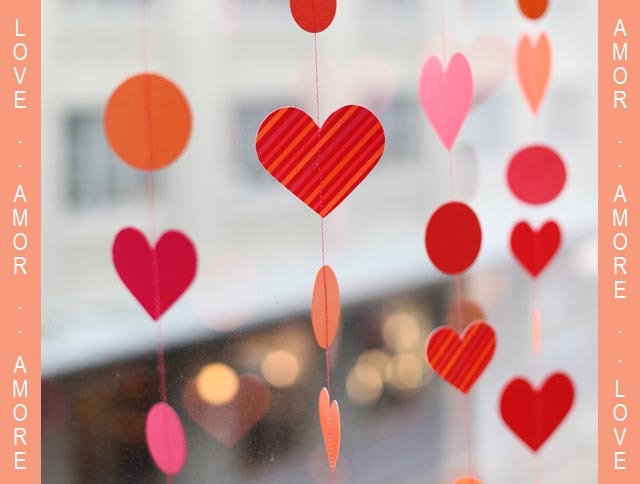 I was finally able to pick five projects, but left in my Pinterest board "Valentine's XOXO" over one hundred theme-related ideas for everyone to explore. 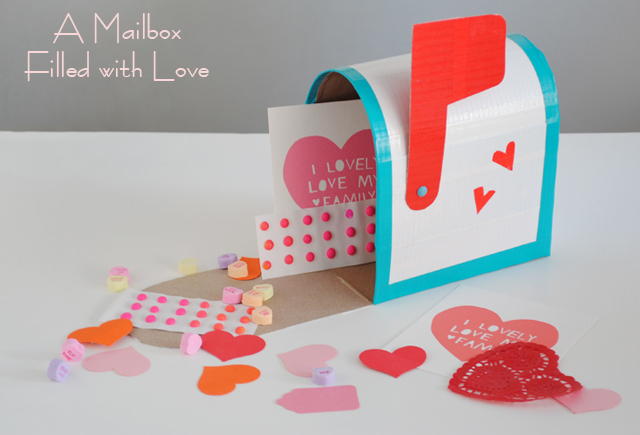 A craft that I am fascinated with is the Play Mail Box, shown above, created by Mermag. How original is that? A mailbox made of cereal boxes and duct tape. Genius!! ...and so useful for little ones to carry all of their Valentine's presents, especially those in Pre-K or Kindergarten... Extremely cute!! 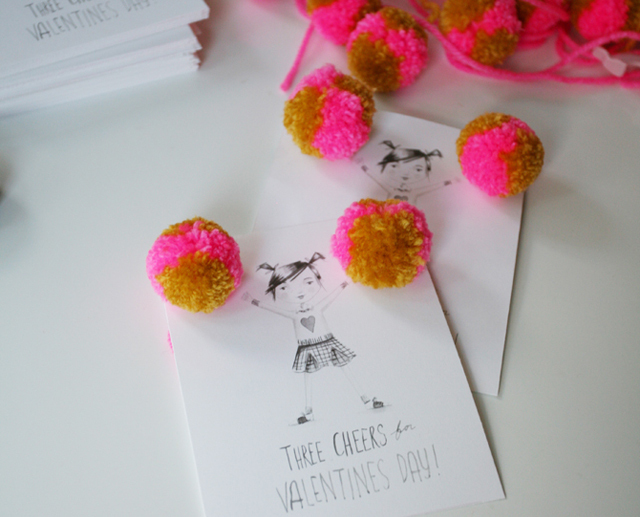 Next: Cheerleader Valentine's + Free Printable by See Jane Blog. A perfect card for my 10 yr./old Naomi who, at this point feels, like any card bought in a store is either too childish, or just not cool enough... Great for her girlfriends who also feel the same way. Something for the boys!! We usually take a long time picking cards that are neutral, good for boys and girls, or choosing some cards for boys and different ones for girls. 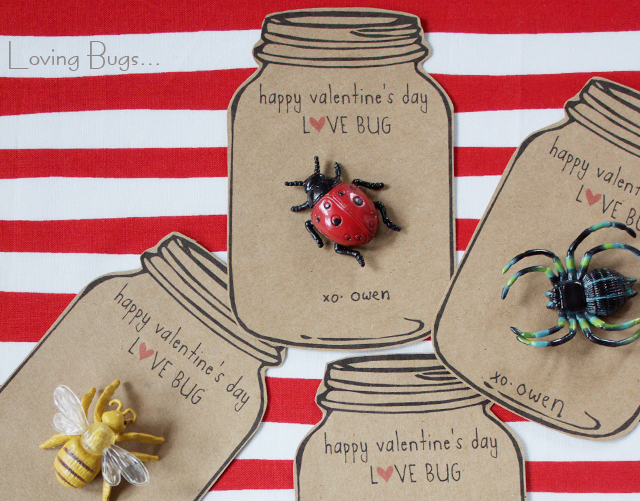 I think these "Love Bug Valentine's" by Dandee-Designs, will be perfect for my younger daughter's friends in first grade, boys and girls. 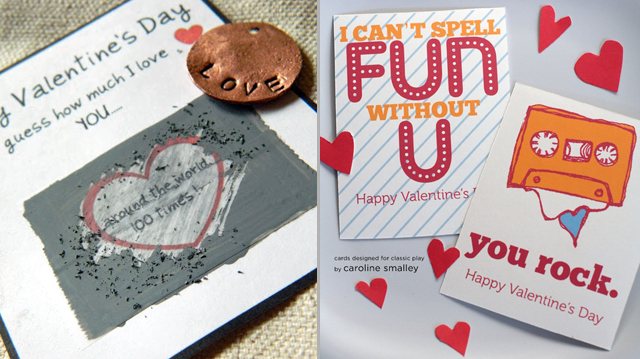 Valentine's Day Scratch Off Messages by Creative Carmella and Rock n Roll Valentine's Day Cards by Classic Play... Very playful!! 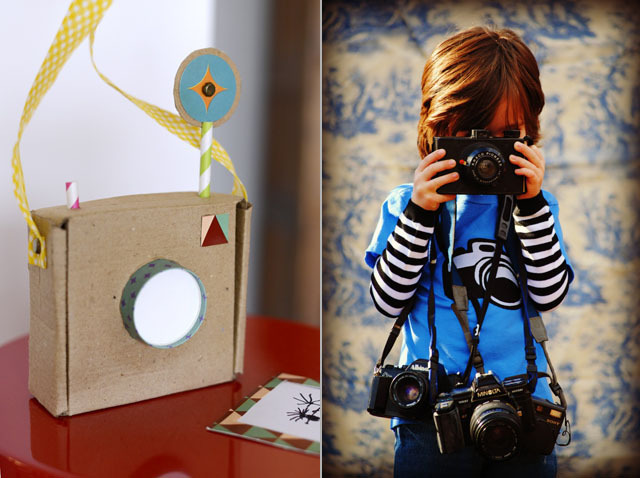 Hope these projects get your imagination going...Have fun and happy crafting!! Have you realized all the furor with the combination of these two colors? Mint and emerald green are taking over the shelves around the world, online and offline too... And, I am loving it!! Right at this moment, when winter starts to feel too long and the black-white-gray combo doesn't seem to inspire me so much anymore, a touch of green feels perfectly right. 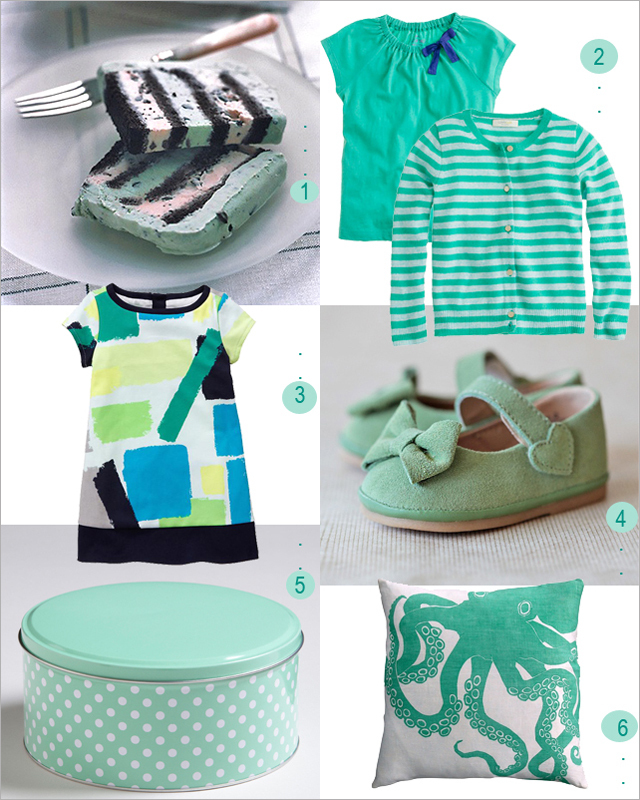 A hint of spring, a fresh sensation, all together a good vibration, mint and emerald hues are here to stay, and make trends everywhere for the upcoming months, from clothing and accessories to decor, and even food... Hello, Mint Chocolate Ice Cream Cake!! Here are some of my favorite mint and emerald things for kids and home so far, but if you are suffering of a color crush and can't get enough of it, then head over to our NEW Pinterest board "Emerald and Mint" fully loaded with gorgeous photography and cool stuff... I'll have a mint tea in the meantime... Cheers!! 1:: Mint Chocolate Ice Cream Cake by Martha Stewart.com, available here . 2:: Girls' Elastic Bow Tee and Striped Cardigan by J.Crew, available here . 3:: Geo Ponte Shift Dress by Gap, available here. 4:: Sweet Mint Mary Jane Shoes at Ruche.com, available here. 5:: Mini Dots Round Tin at World Market.com, available here. 6:: Turquoise Octopus Pillow by Dermon Peterson, available here. 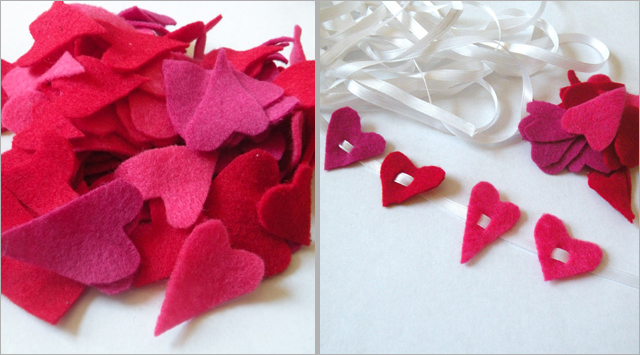 100 Hearts String by Toddler Approved, available here. 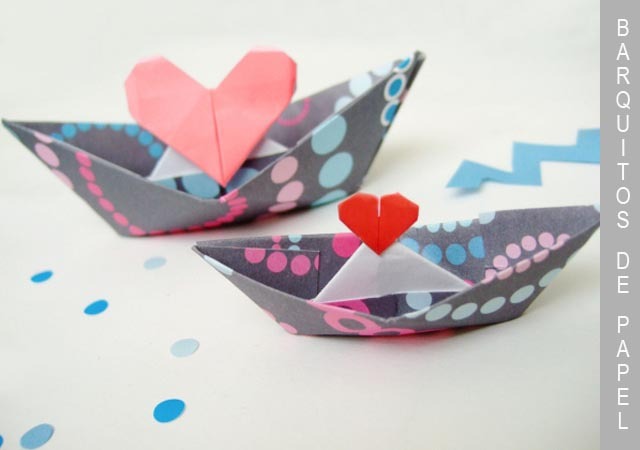 Barquitos de Papel (Paper Boats) by Escarabajos, Bichos y Mariposas, available here. Cardboard Tube Cupid by Spoonful.com, available here. 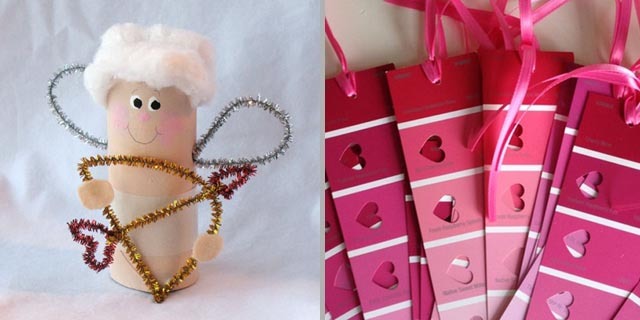 Paint Chips Valentine's Bookmarks by Inhabitots.com, available here. Give a Little Love by Curly Birds.com, available here. Hope you love these projects as much as I do... Happy V-day crafting!! 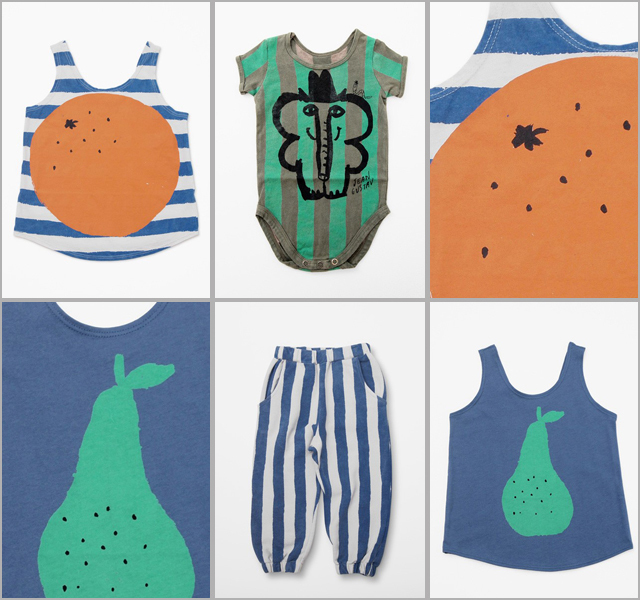 How fun are these designs from hip Spanish brand Bobo Choses? ...I am fascinated with the whole collection full of trendy colors, bold graphics and comfortable styles- a smart interpretation of children's casual fashion, playful and easy-to-wear, perfect for those days when the temperature starts to go up. "Petit Grocery Jean Gustav" is the theme for the entire line inspired by Jean Gustav, a cute little elephant with a grocer's soul. 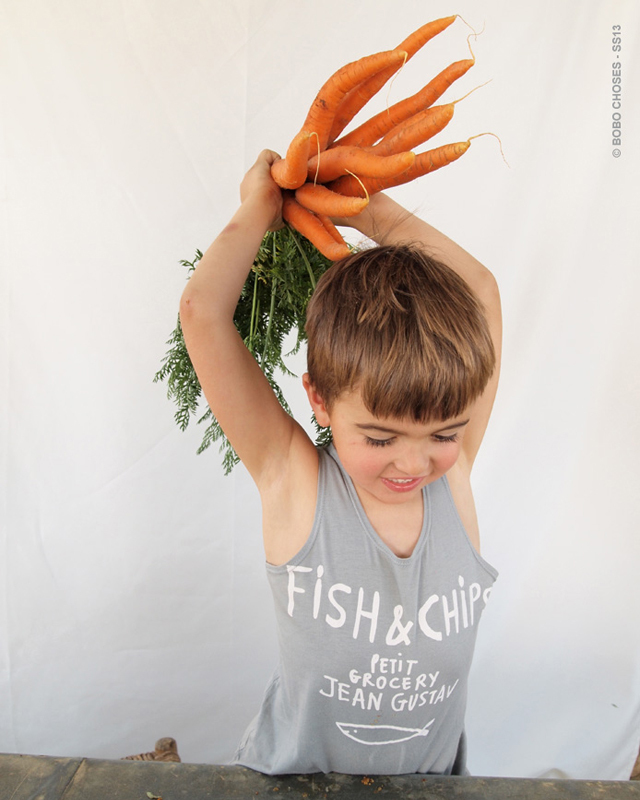 Jean Gustav invites everyone to visit his grocery shop to enjoy the flavors of his gigantic pears, tomatoes, lemons, and everything else he has to offer.... What a cute idea!! 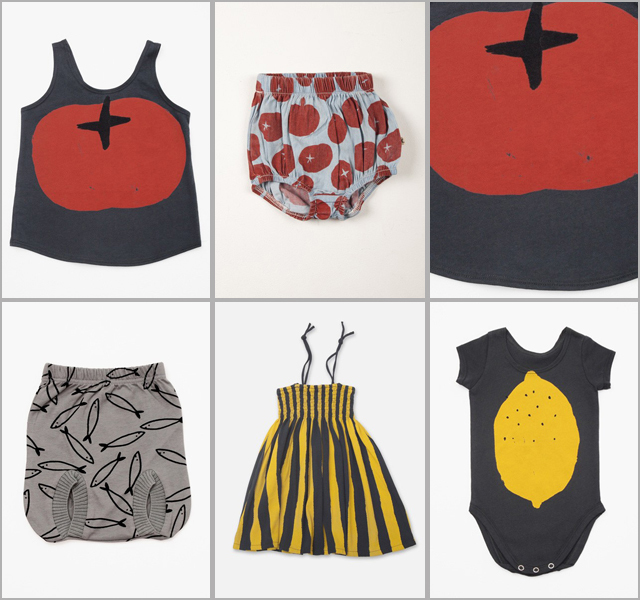 Onesies, diaper covers, tank tops, graphic tees, long dresses, and more... the collection is large with a nice variety of pieces to mix and match, and just to make it even better, everything is made of 100% organic cotton... Que maravilla!! 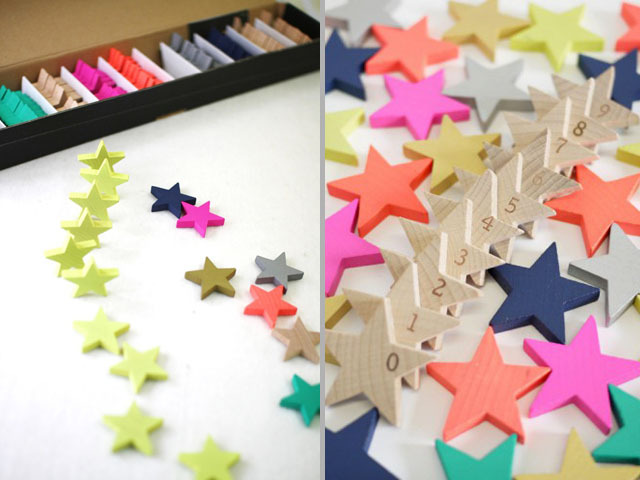 Two thumbs up to the creative team of Bobo Choses, art directors Laia Aguilar and Adriana Esperalba!! ... Una coleccion muy maja!! Bobo Choses collection available here. All pictures provided by Bobo Choses. The first month of the year is over and I am welcoming February with a happy grin. February always invites me to imagine spring. Days are getting a little longer and, Chuckie, the Long Island groundhog, predicted this morning that in fact, spring is just around the corner. He did not see his shadow... Yaay!! But, there is a lot more to February. As it turns out, it is a really busy month for family fun, starting with this Groundhog-Super Bowl weekend, Valentine's Day in the middle, President's Day a few days later and, even Oscar's night, closer to the end... All good stuff!! To top it up, February is also "Bake for Family Fun" month. A celebration that I didn't know of, but thanks to my new Mom's Weekly Planner, I got to discover it and adopt it as a cool family celebration. I like baking, it can be something very simple, a pizza, a pasta, a cookie, or something elaborated with great level of difficulty, like a french pastry or a souffle. In any case, the good thing about this month's celebration is that baking is a great excuse to spend family time together, have the kids learn how to measure, read recipes, and make something new, while talking, joking, and having fun. There is also a fascinating aspect about baking for little ones- the surprise factor, the not knowing if things will come out right or really wrong, until the baked subject is pulled out of the oven. I got curious and researched a little bit about this month's celebration... I found this great website by the Home Baking Association, which has prepared a whole schedule for the month with all kind of recipes to turn February into a fun month loaded with yummy preparations. Week by week, the HBA's website delivers different projects adapted to kids of different ages, from cookies and cakes to pizza and bread. Sounds good, so far? 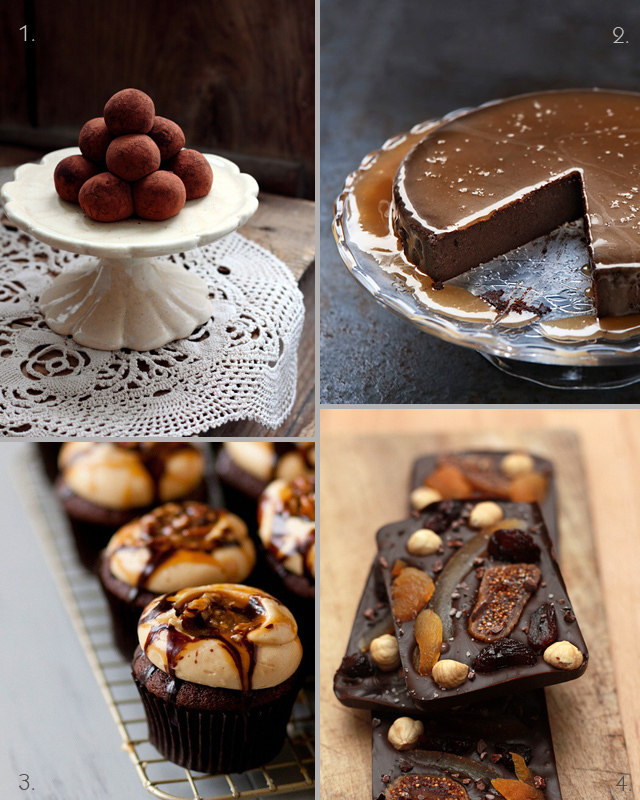 Well, I also decided to mix my love for chocolate with February's Bake for Family Fun celebrations, and put together the pictures and links to the recipes that I'd like to try right now. Winter always elevates my cravings for chocolate, I guess it has something to do with the need for more calories to keep my body warm... I don't know, but those perfectly round chocolate truffles, or the chocolate cookies with coffee ice cream look very tempting... Don't they?? Not to twist your arm, but in case you feel as tempted as I am, here you have the links to the recipes... Have fun and happy February, everyone!! 2:: Chocolate Cake with Salted Caramel Sauce by Easy Eats, available here. 3:: Turtles Cupcakes by Annie's Eats, available here. 4:: How to make Chocolate Bars? by David Lebovitz, available here. 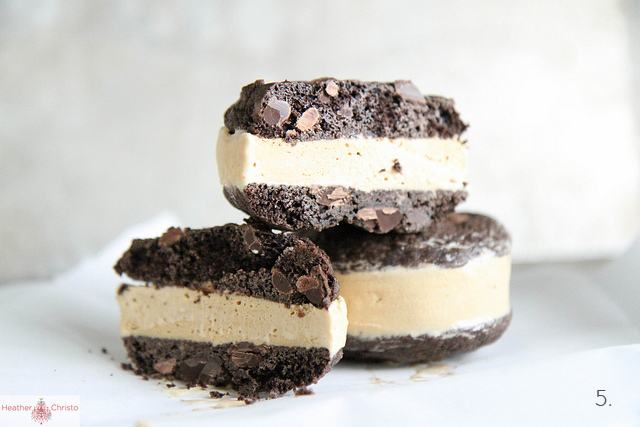 5:: Chocolate Coffee Ice Cream Sandwiches by Heather Cristo, available here.